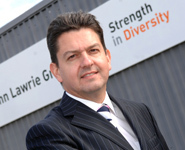 Scottish metal reprocessor, steel trading and environmental services company John Lawrie Group has reported a significant rise in turnover and profits for 2010. The latest accounts lodged with Companies House show profit before tax almost doubled to £4.1m last year, compared to £2.18m the previous year, and turnover for the year ended 31 December 2010 increased by £20m to reach £85m. The Aberdeen-based firm invested a total of £3.1m in new fixed assets last year, which included the construction of a new operating centre and head office on Greenbank Road, Aberdeen. John Lawrie Group, which has operations globally, also witnessed an increase in demand for oilfield tubulars from the American market. Established in Aberdeen in the 1930’s as a scrap metal merchant, the John Lawrie Group now offers a diverse range of industrial services and has developed an enviable reputation for quality customer service. It is one of the country’s leading privately owned companies and employs a 100-strong workforce across operations in the UK, America and Europe.